View of “Closed Down Clubs,” 2018. In the fifth century BCE, a Greek cult emerged that was dedicated to the demigod Asclepius, whose province was healing and medicine. Before retiring to the holiest chamber of his temple to engage in sacred sleep, adherents of the faith would pray to Mnemosyne—goddess of memory—in the hope that their dreams would not be forgotten. 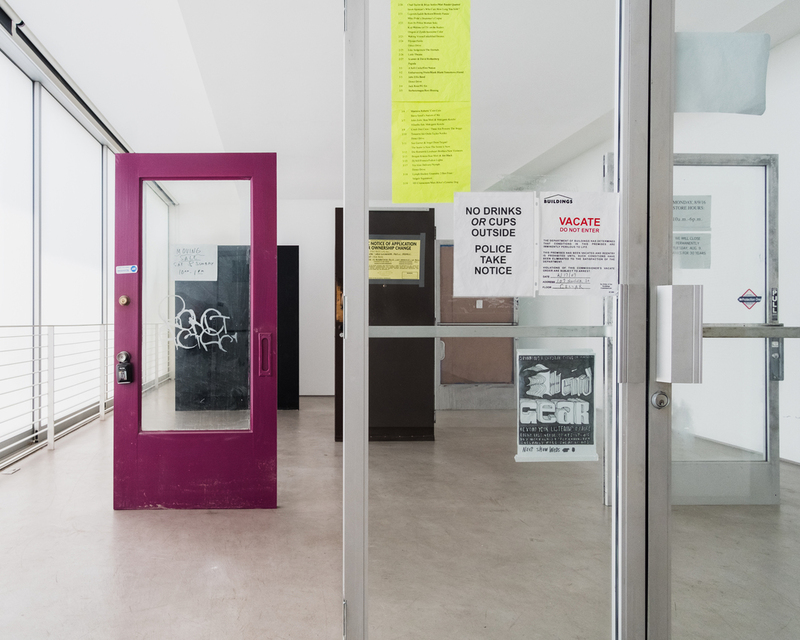 Instead of soliciting the facility to remember, Fiona Connor’s sculptural replicas of club doors, “Closed Down Clubs,” 2017–2018, point to the potential foreclosure of public memory. Connor is meticulous with her reproductions, which encompass everything from the unsightly residue of tape left on glass to the small “This Saxophone Kills Fascists” fliers tucked into the panic bar of a darkly painted door. Sometimes such ephemera adhered to the doors gives up their identity (Club Tee Gee, or Café Avanti), but most of the portals remain unnamed and anonymous, even as their utter specificity is made spectacular. Each of the nine doors in this installation stands upright without the walls that would support it and define it as a threshold. In allowing the viewer to see the front and back of the doors without passing through them, Connor permits one to inhabit two distinct positions in quick succession—that of the patron, suddenly closed out of a favorite haunt, and that of the owner, who must confront the final view from inside. Both of these psychological states involve grief, but their charge is different, and their investments and losses are asymmetrical. Never before has blue painter’s tape appeared so melancholic, a neon list of upcoming performers so prized, or a door so sacred.